Enlightening (Residential Lighting Blog): Amazing Red Tag deals! On display the green crystals are a bit darker than they look in this picture, but this gives you a good idea of what it looks like. 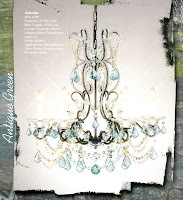 The original price on this chandelier was $1620, but we've just marked it down to $450!!! Next we have a Fine Arts #552440. This picture does NOT do it justice! This is from their "Brazilian" collection ~ it was originally priced at $5241.60 but is now marked down to $999! 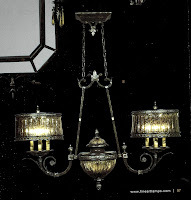 They describe the glass as hand-blown mottled sable, and the iron is brown patina with prata antiga silver accents. Beautiful!